George Airport is located in the Garden Route city of George, Western Cape. It was formerly known as P.W. Botha Airport, originally built in 1977 as an exact replica of the Keetmanshoop Airport in Namibia. Today, with thanks to changes and expansion, it doesn’t look similar anymore. George Airport is seeing an annual increase in passenger numbers, with 2016 recording over 700,000. George Airport (IATA code: GRJ) is the reputable airport serving the Garden Route. Flights to George Airport are provided by international airlines such as South African Airways, Air France and British Airways. Domestic airlines that land here include Kulula, Mango and FlySafair. George Airport is a 10-minute drive from the city centre of George. Book your cheap flights to and from George Airport online! George Airport is a small airport located in the city of George, Western Cape. It is an efficient airport to use if your destination is the magnificent Garden Route. George Airport is Africa’s first solar-powered airfield. The airport has seen around 600000 passengers per year pass through and is expected to increase annually. Apart from passenger flights, it also has a cargo distribution centre for items including flowers and fish, owing to its cold storage facility. Popular flight routes to George Airport are from Johannesburg to George and Cape Town to George. George Airport has a great selection of restaurants and clothing stores. Discover a variety of restaurants, pubs, clothing and accessory stores. 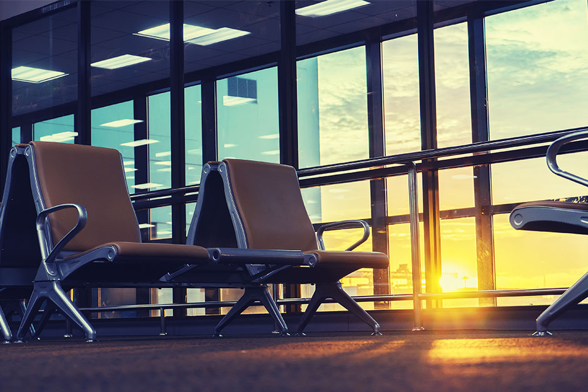 Find the essential services at George Airport including ATMs, chapel and prayer rooms, first aid facilities, public telephones as well as a viewing deck. Cuisine options range from national franchise restaurants to sweets and snacks. They can be located in the departure hall and on the first floor. Located in the George Airport domestic departures is the Bidvest Premier Lounge for your enjoyment. The Bidvest Premier Lounge is great for relaxing before boarding your flight. This 3-star guest house is a 7-minute drive from George Airport. This stunning guesthouse overlooks the Outeniqua Mountains. Features include an airport shuttle, free Wi-Fi and an outdoor pool. This 5-star hotel is a 10-minute drive from George Airport. It is the first South African hotel which features an Ernie Els signature golf course in South Africa. Guests can enjoy the swimming pool, gym, tennis and squash court, conference centre and a whale viewing deck. Dragonfly Cottage is a 10-minute drive from George Airport. Accommodation includes secure parking, free Wi-Fi and communal Satellite TV. Imali Express is located at Arrivals Halls. There are a variety of parking options available at George Airport. By reserving a parking bay, a month or more in advanced, you can save as much as 50%. There is a vast amount of parking space but it is best to enquire early to avoid the high prices! George Airport is a 10-km drive from the city centre of George. There are various transport options available to and from the airport. Choose from a list of reputable car rental services or approved taxi and shuttle operators.